The director of policy planning at the Department of State and former staff director for the Senate Foreign Relations Committee, David McKean (Tommy the Cork: Washington's Ultimate Insider from Roosevelt to Reagan, 2003, etc.) knows his politics and explains the difficulties encountered in uniting the widely varied states during the Colonial period. 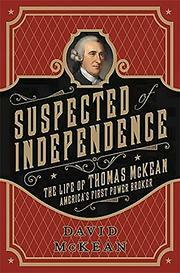 By the time Thomas McKean was 20, he had established himself as one of the hardest-working and most effective lawyers in New Castle, the capital of the lower counties of Pennsylvania. From there, the larger stage of Philadelphia called, offering culture, economics, and plenty of opportunities for an ambitious lawyer. McKean sat on every important commission of those early years, and the author praises his “pragmatism and political dexterity.” Establishing Pennsylvania’s new constitution led him to the radical small farmers and tradesmen in the West, who wanted to eliminate the property requirement, but McKean had no use for anyone who wasn’t of the professional trades—i.e., lawyers and doctors. He felt that only upper-class citizens could effectively run the country. The list of his accomplishments is long: he was a signer of the Declaration of Independence, a three-term governor of Pennsylvania, and the president of the Continental Congress. Most important was his devotion to the rule of law. His Supreme Court in Pennsylvania was more powerful than the newly established U.S. Court. He fought to establish equity between the three arms of government and served in all three. He was a powerful man living in the right time and place. At the same time, he was arrogant, vain, and overbearing, and he is credited with the beginnings of the “spoil” system of patronage and nepotism in America. His story has been long in coming and worth the wait. For students of the Revolutionary era, the author delivers a useful biography of a significant player in the birth pangs of the new nation.